A Blendable is an asset that has properties which can be smoothly interpolated (blended) with other blendables. We mostly used blendables for PostProcessMaterials but the system can be used for anything that should be depending on the view (usually dependent on the camera position). We have Blendables in the engine for a while but only used for PostprocessMaterils / PostprocessMaterialInstances. But the concept is more general purpose as it allows to blend arbitrary data (linear values or colors are best suitable) to some final data. Any subsystem can pickup the data in the view and affect rendering. As the data is blended per view it means in the splitscreen case you can have different settings blended for each view (e.g. hit indicator affecting post process). The LightPropagationVolumeBlendable asset was created to demonstrate on how to create new blendables and to show how we can replace the existing PostProcessSettings. The existing system worked well when it was small but the large amount of settings showed the need for a more sophisticated system. 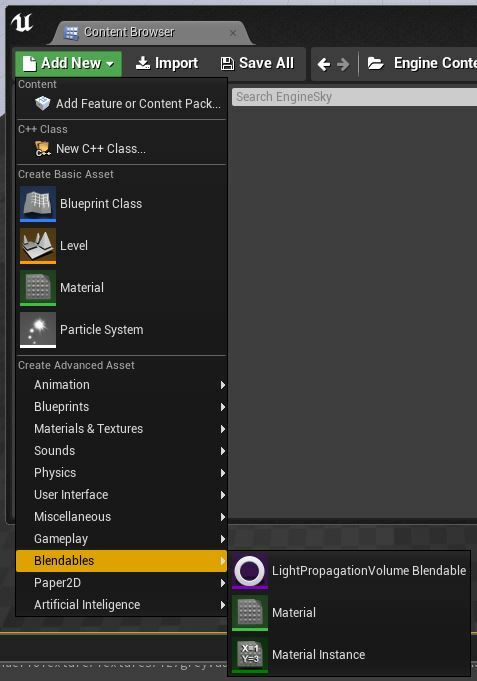 Blendable assets show up in the content browser in the Blendable category. You can use the Add New or filter asset by this category. Each Blendable reference can have its own weight, the asset can have a weight (see LightPropagationVolumeBlendable) and a per-property-weight would be easy to do. Breaking up the large struct make interaction with blueprints more efficient and simpler. The container is implemented as an array of weights and IBlendableInterface references. When you open the PostProcessVolume setting and look at the blendables array you see an array of weightes with references to a blendable asset. The weights are usually in the 0..1 range and the reference can be to an asset living in a package (created with the content browser) or living in the object that contains the blendables array. The blendables container can be found in the post process settings (here in a postprocess volume). The array here has three elements, a LightPropagationVolumeBlendable (living in the volume object), a not yet used array element and a reference to a an asset (living an in a package) called LPV0. The weights are 1.0 for both blendables. When you create new elements in the array you can choose to create a blendable of a specitic type (currently only LightPropagationVolumeBlendable) or using an asset reference (e.g. LightPropagationVolumeBlendable, Material, Material Instance). Over time we intend to create more blendable types (e.g. Bloom, SceneColor, DepthOfField, ...). The reference can be of any type that is a Blendable (implements the IBlendableInterface). The order in the array is opposite to how layers stack because their blending is applied from top to bottom and blending is overwriting the data that was there before. Keep in mind the data of many volumes (or other objects) are getting combined taking weight and priority into account. Note: It's a good practice to have a unbound PostProcessVolume with lower priority in the level called "global". To get get full control over an existing level you can add an unbound volume with high priority. To check if a blendable has effect you can quickly adjust it's weight to 0 and back. It's your choice but we suggest the package (referencing a named asset in the package) as it allows for easier bulk adjustments later on minimizing version control conflicts. For maximum programability it's possible to create a blendable in a blueprint. As blueprints are a form of programming this is simialar to putting settings in a UI or hard coding them in the code. The code method is more involved and makes it harder for others tweaking the settings. 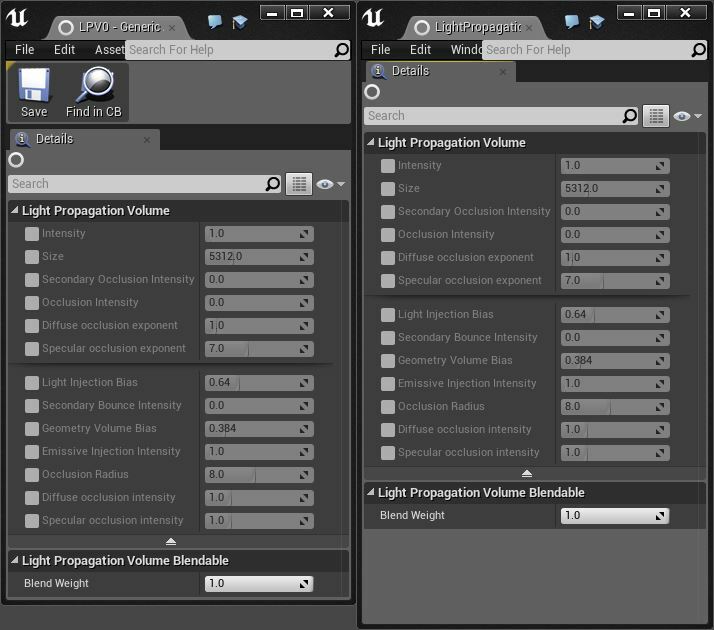 The LightPropagationVolumeBlendable details as they can be seen in the editor. No matter if the blendable was created in the content browser (left) or created in the object (e.g. post process volume) the user interface is similar. It's good practice to give each property a checkbox (weight=0 or weight=1) and give the whole struct a blend weight. Note: The LightPropagationVolumeBlendable properties still exist in the PostProcessSettings for backwards compatibility reasons but we plan to remove the settings from there and make the blendables the only method. At the moment we suggets to copy the LightPropagationVolumeBlendable plugin. After creating the asset you can pick up the blended data the same way the Light Propagation System is doing that. The method GetSingleFinalDataConst() is used to get the data after it was blended. For best performance you might want to avoid calling this function unneccessarily (too often). The AddOrUpdateBlendable blueprint function is exposed where you can find PostProcessSettings. It allows convenient access to the blendables container. You pass in the object that has the Blendables container, the weight and a reference to the blendable. If the reference was already found in the container it simply updates the weight. It doesn't remove container elements as that could confuse other code traversing the container and has implications to the garbage collection. There is no real performance cost a blendable reference of a weight of 0 as removing the element should never be needed. The variable 'BlendableVar' of the type LightPropagationVolumeBlendable (Object Reference) is used to reference an LightPropagationVolumeBlendable asset called 'LPV0'. With the ConstructObjectFromClass blueprint function you can create a new blendable in the blueprint. By setting the Outer of the new object to the object that has the blendables container you get the same behavior as if you would created the object in the UI (create the blendable as part of the object). Here we create an object of the type LightpropagationVolumeBlendable, get the settings and set some members with the SetMembersIn... function. Note: At the moment you need to manually put the override flag to true (checked checkbox), otherwise the property with the same name would not get picked up. For experiments you can use the showflag VisualizeLPV (in editor: Visualize/Light Propagation Volume) to display the blended properties. This was implemented in C++ code and only for this blendable type but later we should be able to expose any property without the need to do any code changes. The showflag VisualizeLPV displays the blended values which makes it useful for debugging. The context sensitive feature when browsing the function AddOrUpdateBlendable doesn't work yet (workaround: disable the 'context sensitive' checkbox). We intend to break up all PostprocessSettings into object like the LightPropagationVolumeBlendable so one day the PostProcessSettings can be removed. Old levels can be converted on load without any data loss. In order to avoid a lot of assets spaming the content packages we would create the objects as part of the level. We want to further polish the blueprint interaction to make it easier to use. 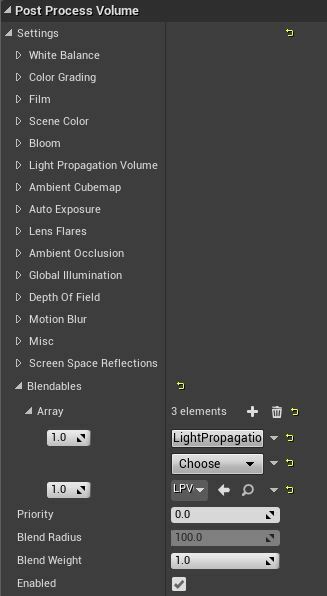 We could easily expose a Blendable array in the world settings and the project settings. In order to get more transpareceny which Blendable are getting applied we should have some debug view showing the weights and asset/object names and types.